Welcome to the fifth and final of my detailed London Coffee Festival Saturday Supplements to go with my round-up of the festival as a whole. In this series, I’ve covered the interesting coffee kit that I came across, followed with my coffee experiences, my time at the La Cimbali Sensory Sessions and the various reusable cups that I picked up at the festival. For this, the final instalment, it’s the turn of the coffee, arguably what the Coffee Festival is all about! As was the case in previous years, I could have spent all three days I was at the Festival visiting roasters old and new and I still wouldn’t have got around them all. So, with apologies to all the wonderful roasters I failed to visit, here’s a round-up of all the wonderful roasters I did manage to catch up with. As I did at Cup North, I’ve split them into two categories: Old Friends and New, representing roasters that I’ve met before and those who I ran into for the first time. I’ve also taken a look at the True Artisan Café, the innovative Dear Origin & Sons, and a general round-up of everything else I saw! Every year Grumpy Mule take a big stand opposite the True Artisan Café and every year I seem to manage to avoid visiting them. However, having caught up with them at Cup North, I was determined not to miss out this year. Grumpy Mule had its usual selection of coffee on display, a mix of single-origins and blends, and it was doing an interesting feature where you could have your own custom label printed on a bag of Grumpy Mule coffee, using any three words you liked. Mine, of course, we’re Brian’s Coffee Spot! Naturally I was given the bag to take away with me, a single-origin coffee from Tanzania, which, rather embarrassingly, I’ve yet to try. Someone else trying a variation of the three word trick was Hope & Glory. Like Grumpy Mule, I also caught up with them for the first time at Cup North having long been a fan of the coffee. At the London Coffee Festival, Hope & Glory were on the La Cimbali Espresso Pit Stop in the main hall, knocking out shots of an exclusive festival blend. The idea here was to come up three words to describe the coffee, with the best three-word description winning a prize. My three words were “sweet, smooth and punchy”. As for the blend itself, I liked it, although it was probably a little too punchy for my palette. Hope & Glory had also hit on the excellent idea of handing out 50 gram sample bags rather than full 250 gram bags of its coffee. I picked up a handful, including one of the last bags of the amazing Blenheim espresso blend. Last in the old friends category is The Roasting Party, who I didn’t run into at Cup North, but who I run into everywhere else! At last year’s festival, The Roasting Party was an instant hit with a massive sofa, one of the few places where I could take my weight off my feet! This year, the stand was even better, with a receding bank of bench seats, which not only provided loads of seats, but also gave an excellent view of the surrounding stands! The theme of the stand this year was “from origin to cup”, starting with some little coffee plants in pots that adorned the bench-seats. There was also a green-bean importer on hand, plus a San Franciscan sample-roaster, and, of course, multiple espresso machines and a couple of brew bars, which, of course, spent all festival banging out drink after drink to coffee-craving festival goers. I made a point of popping by each day to take the weight off my feet and, on the first day I was there, I also had a latte-art masterclass from UK latte art champion, Dhan. And, unsurprisingly, I left laden down with bags of coffee and three lovely Roasting Party cups! First in the new friends category is Island Roasted, from the Isle of Wight. This was very much a chance discovery: wandering around as I do, I happened upon the stall. Island Roasted is very much an Isle of Wight affair at the moment, although it’s been roasting since 2010, steadily expanding its volume and range. These days it roasts two or three blends and a handful of single-origins. I tried the Honduras Finca Los Mangos, which, as a filter, was a really juicy, complex brew. The other roaster I “discovered” was Pact. I’ve been aware of Pact since it launched, providing a selection of blends and single-origins by mail order, but I’d never come across them in person until the Festival. The guys from Pact were on the Sage Appliances stand, where they’d teamed up with Sage to provide coffee subscriptions with each new machine. After all, if you’re going to spend all that money on a new espresso machine, you want decent coffee to go with it! Pact had a couple of options that were running through the Sage machines: I played it safe and went with the Fruit and Nut espresso blend, which, I have to say, went exceedingly well in milk, even when I made it! A testament to both the Sage espresso machine and to the coffee. Pact also let me have some of its decaf for the Coffee Spot Decaf Challenge. 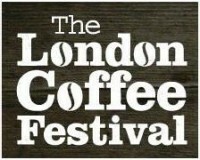 Finally, a note about all the coffee I got at the London Coffee Festival. In all, I was given about three kilograms of coffee, an embarrassingly large amount, since, in a good week, I’ll get through maybe 300 grams (not including decaf). So, that worked out at about a 10-week supply. What made it worse is that I was off to America less than a month later, so there was no chance I’d get through it all while it was still fresh. Instead, what I’ve discovered is that if I put the coffee in the freezer as soon as I get it, then take it out, defrost it and use it as normal, it keeps pretty well (I don’t advocate putting it in the freezer, take a bit out and putting it back again; that doesn’t work nearly as well). So, to everyone who gave me coffee at the Festival (including Extract, Heart and Graft and Small Batch), I apologise. I’d love to tell everyone how wonderful it was, but the majority of it’s still in my freezer! Finally, I caught up with Jodie of Iris & June. Iris & June is a coffee shop near Victoria Station in London which has long been on my list, but which I only got around to visiting in March, 2016. In my defence, it’s a part of London that I rarely go to and the two previous times I had planned to go, my plans fell through at short notice. So, hurrah for the True Artisan Café; at least I managed to say hello. One of the most innovative uses of the True Artisan Café was when Glasgow’s Dear Green Coffee, Cornwall’s Origin and London’s Climpson and Sons got together to prove that speciality roasters could play together nicely (although this has been previously done, with four Manchester roasters coming together to produce a bespoke blend for Cup North last year). The Dear Origin & Sons challenge was simple. Each roaster roasted a single-origin (all African coffees) which would form part of the blend; it was then up to the three roasters to blend the constituent parts in whatever proportion they liked to produce their own version of the blend. The outcome was, to say the least, interesting! I started with Dear Green, who had blended 40% of its Rwandan Karengera with 30% of Origin’s Tanzania Tweega and 30% of Climpson & Sons Burundi Kayanza. I was expecting not to like it, usually preferring my African coffees as filters rather than espressos, but actually I really liked it. Although it was quite fruity, it wasn’t too sharp, instead producing a nice, rounded, well-balanced cup. I also liked the Origin blend, which, rather bravely, featured 50% of the Climpson & Sons Burundi, only 35% of its own component and a mere 15% of Dear Green’s Rwandan. However, it too was a well-balanced, complex cup which, although it was a close-run thing, I preferred over the Dear Green blend. Finally, I tried the Climpson & Sons offering, which was technically only being offered with milk. However, for comparison purposes, I got the barista to make me a straight espresso shot. I also cunningly failed to make a note of the ratios, but having had it on its own, let’s just say that I can see why Climpson and Sons were offering it through milk… In defence of Climpson and Sons, I’ve often found its espresso blends (and single-origin roasts) a little too bright and fruity for my palette and so it was with this one. So, for me, the winner was Origin. Did anyone else take the challenge? If so, what was your favourite? Before I go, just a quick reminder that it wasn’t all about the coffee, for where would coffee be without its soulmate, cake? For me, the (cake) highlight of the London Coffee Festival was running into Sarah of B-Tempted. I’d first met Sarah at the 2013 London Coffee Festival. If you’ve not come across Sarah and B-Tempted before, she makes the most amazing brownies and friands. What’s even more impressive is that they are gluten-free, although you’d never know just from tasting them. My advice: always make friends with the lady who carries free samples of cake around with her in her handbag! Another cake win was the Crosstown Doughnuts stand. Crosstown supply some of my favourite coffee shops in London and the doughnuts are outstanding. One or two (or possibly more) doughnuts may have been purchased and consumed at the Coffee Festival (and that’s just by me!). Talking of sweet things, it was also good to renew my acquaintance with Paul from Kokoa Collection, supplier of some of the best hot chocolate in the country. It’s not a drink I often indulge in, but when I do, I make sure I look out for Kokoa Collection on the menu! Finally, the food village that had been a feature of previous London Coffee Festivals was much reduced this year, having been replaced with the White Label Kitchen. Thankfully the wonderful Arancini Brothers were still in attendance, so I didn’t go hungry. Somehow I can’t imagine a London Coffee Festival without them to keep me going! So, that’s it for another year. If you’re missing your festival fix, don’t forget that there’s the New York Coffee Festival, which will be hitting the Big Apple from Friday, 25th September to Sunday, 27th. Sadly I won’t be there, but that’s no reason you shouldn’t go! Then, before you know it, it will be London Coffee Festival time again, which for 2016 is back at the Old Truman Brewery from Thursday, 7th April to Sunday 10th. Next year’s festival promises to be even bigger and better than before and having had a sneak preview of the layout and exhibitors list, I can tell you I’m already excited!